Many of you won’t like my opinion about the regulatory debate on the word “milk,” but many of you agree and have told me so. Even if FDA enforces current regulations that define milk as an animal product, not a plant-based food, that doesn’t mean consumers are going to stop drinking the other stuff, which The Onion refers to as nut sweat (read the satire HERE). Owning the word milk will not increase milk consumption. What will increase milk consumption is innovation. The status quo is not working and owning the word milk is not going to make a difference. Volume sales continue to decline. In my 25 years of writing for the dairy industry, I have never once written that milk consumption has increased. It is time to be proactive. 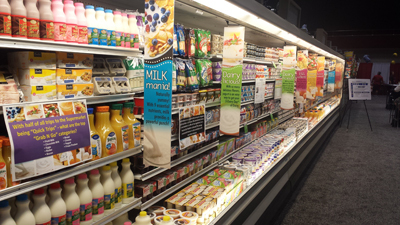 At IFT18 a few weeks ago in Chicago, clear dairy protein beverages were trending. As were dairy proteins in other formats. The U.S. Dairy Export Council—the folks promoting all things dairy—recognize that the future of the industry is not white milk. 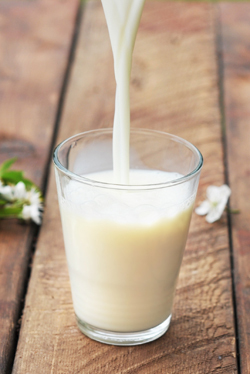 Dairy proteins—often in beverages—are paramount for the longevity of the milk industry. Research has established dairy proteins’ unique ability to help improve body composition during weight loss, increase muscle mass when combined with resistance training, aid in muscle recovery after endurance exercise and help fight age-related muscle loss. At IFT18, USDEC, in partnership with affiliated university application labs, developed two prototypes that bring dairy protein benefits to life in trendy, on-the-go applications. 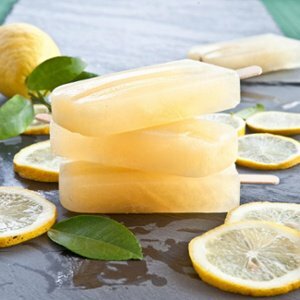 Developed in conjunction with the Midwest Dairy Foods Research Center at the University of Minnesota, USDEC sampled Lemon Ginger Ice Pops with Whey Protein. The other prototype--Savory Asian Granola with Whey Permeate and Protein Crisps—was developed by the Wisconsin Center for Dairy Research. On the non-dairy beverage side of innovation, Synergy Flavors, based in a north suburb of Chicago, captured the flavor and authenticity of the Windy City in its themed booth: Simply Chicago. The company showcased foods and beverages incorporating its flavors, extracts and essences, inspired by the beloved gardens of the city. The Water Garden, for example, featured fruit- and floral-flavored protein, sparkling and still waters, as well as a twist on the traditional coffee bar. The Arboretum had earth-inspired flavored functional snacks and beverages. Milk processors around the world are evolving into beverage processors, where milk or other dairy ingredients are often the primary ingredient. In some instances, processors are manufacturing beverages with no dairy component. These range from flavored waters to nut-based beverages. Take Arla Foods, for example, which recently introduced Milk & Oats to the U.K. market. This ready-to-drink refrigerated breakfast beverage is a simple blend of skimmed milk, hearty wholegrain oats and natural flavor that comes in single-serve 250-milliliter plastic bottles. It comes in two breakfast-inspired variants--Maple and Vanilla—and is high in fiber and protein, low in fat and a source of calcium. Such a breakfast drink concept can further be differentiated with caffeinated versions or additional vitamins and minerals for a nutritional boost. Monster Energy Co., is doing that with Caffé Monster. Shelf-stable Caffé Monster is made with 100% arabica coffee and reduced-fat milk. The drink comes in three varieties--Mocha, Salted Caramel and Vanilla--in a 13.7-ounce sleek glass bottle. Energy comes from the caffeine in the brewed coffee, and added taurine, B vitamins and coffee fruit extract, as well as sugar and glucose. Sucralose sweetener helps keep calories down. One bottle contains 180 calories, 4 grams of fat, 29 grams of sugar and 7 grams of protein. Sportsman Shake comes in Chocolate, Coffee and Vanilla varieties. The cans have either a hunting design, with the catchphrase of “each sip hits the mark,” or fishing, with “one sip and you’ll be hooked.” They are designed to fill you up so you can either focus on the hunt, stay out longer and be on top of the game, or to help you stay out all day and keep fishing and ready for the big one. DFA has numerous hunting and fishing expert partners endorsing the shakes. Imagine, the hunting and fishing industries promoting a dairy-based beverage! Made with high-quality dairy, one can provides 350 to 360 calories, 9 grams of fat and 53 to 56 grams of sugar. The Coffee variety is made with real brewed coffee, which provides extra kick with caffeine. 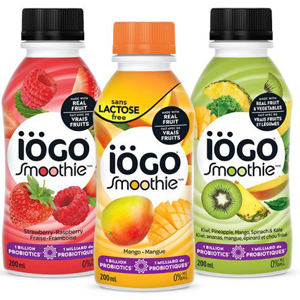 Canadian dairy cooperative Agropur is launching a new line of probiotic drinks as part of its Iögo brand. Milk permeate is the first ingredient in these refrigerated beverages that come in three varieties: Kiwi, Pineapple, Mango, Spinach & Kale; Mango; and Strawberry-Raspberry. The drink comes in 200- and 300-milliliter single-serve bottles, as well as 1-liter multi-serve bottles. Cane sugar and fruit puree sweeten this non-fat product, while milk proteins give it an extra protein boost. A 200-milliliter serving contains 110 calories, 18 grams of sugar, 5 grams of protein and one billion probiotic BB-12 Bifidobacterium lactis cultures. Lactose-free versions include the lactase enzyme. The drinks are free from artificial colors, flavors and preservatives, as well as gluten. 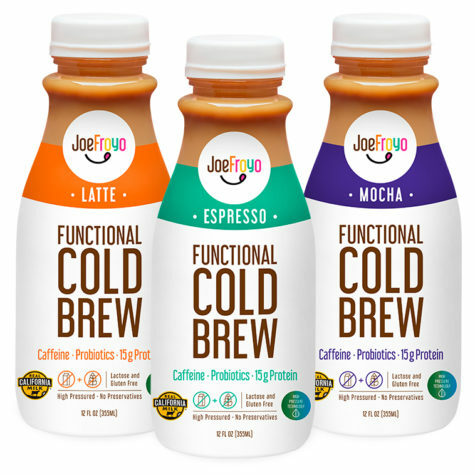 New JoeFroyo Functional Cold Brew combines the kick of caffeine from cold-brew coffee with probiotics and protein from drinkable yogurt. Featuring 15 grams of natural protein per 12-ounce serving and six live and active probiotic cultures, JoeFroyo adds valuable health benefits from dairy, all while remaining 100% lactose free. It also contains no artificial colors or sweeteners, no preservatives and no gluten. JoeFroyo Functional Cold Brew is also one of the first to market with a high-pressure processed (HPP) drinkable dairy beverage. High-pressure processing extends the shelf-life of food and beverage products without relying on chemical preservatives. It also keeps probiotic cultures live and active. HPP is common in the juice, dip and salsa industries. The beverage comes in the ready-to-drink format, as well as an over-ice version (via one-gallon jug for pour overs or a 2.5-gallon bag-in-box to be used in dairy dispensers) and a frozen blended dispensed version. A 12-ounce ready-to-drink bottle contains 270 to 290 calories, 3 to 4 grams of fat, 27 to 28 grams of sugar, and 15 to 16 grams of protein, depending on variety, of which there are three. They are: Espresso, Latte and Mocha flavors. The protein content gets a boost from the addition of milk protein isolate and whey. Here’s something to think about. Among all beverages, refrigerated ready-to-drink coffee and tea described as specialty foods showed the greatest dollar growth from 2015 to 2017, increasing 63.2%, according to the Specialty Food Association. The specialty nature of these beverages comes from a combination of qualities, including uniqueness, origin, processing method, design, limited supply, unusual application or use, extraordinary packaging or channel of distribution. Most of the refrigerated coffees—many are cold-brew coffees--contain milk. Cold-brew tea lattes are predicted to be the next big trend. This is an innovation opportunity for dairy processors. Further, consider adding value to these tea beverages with additional better-for-you ingredients. Tea has a healthful halo. Consumers are willing to pay for value-added beverages and they want variety. According to the recent Packaged Facts report “U.S. Beverage Market Outlook 2018,” a growing number of U.S. consumers are willing to try beverages from all over the world. The beverage segment most on trend for multicultural inspiration is tea. Matcha Tea: Popular in China and Japan, matcha is a highly nutritional form of green tea with high concentrations of potassium, magnesium, vitamins A and C, and fiber as well as high levels of L-theanine, a valuable amino acid that is said to have a calming effect on consumers it and substantial amounts of caffeine. It offers health benefits in terms of strengthening the immune system as well as providing an energy boost. Matcha has entered the mainstream as can be seen by the 2017 introduction by Unilever of its first-ever home-brewed matcha teas to its Pure Leaf line of hot and iced tea products. Moringa Tea: Following along the same path as matcha except with origins rooted in India is moringa, a tea made from the leaves of the moringa oleifera tree that is rich in antioxidants. Benefits attributed to moringa include increased energy and rapid recovery after exercise, mental and emotional balance, and healthy blood sugar levels. Ready-to-drink moringa teas are few and far between, but there are many companies offering moringa teas for brewing. Among them is Terrasoul Superfoods, which has as its goal making nutrient-dense foods more affordable and accessible to consumers. Sencha Tea: Sencha is a variety of green tea that is still relatively new to the U.S. market although it is considered the most popular tea in Japan where it originates. Sencha, reported to contain more antioxidants than matcha, is available in leaf and powder form, as loose tea and in tea bags. At present, many of the brands sold in the U.S. are imports from Japan, but there are U.S. companies that offer Sencha, as well. 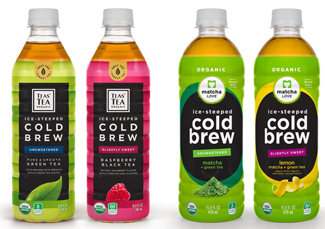 Mizudashi (cold-pressed tea process): The adoption of the cold-brewed process in the ready-to-drink coffee category has begun spreading to the tea category. As with coffee, the cold-brewing process results in a beverage that is reported to be smoother and less bitter and is further said to better preserve the health benefits of the tea than preparing it through a hot-brewing method. The Japanese tea marketer ITO EN in 2017 launched a lineup of ice-steeped cold brew ready-to-drink teas in the U.S. The Kroger Company now offers Simple Truth Mexican Chocolate Cold Brew Tea Latte. This shelf-stable beverage has skim milk as the number-one ingredient. It also includes milk protein isolate, enabling the 9.5-ounce bottle to provide 15 grams of protein. The “sell-by” and “best-by” dates on milk cartons may soon become more meaningful and accurate. Cornell University food scientists have created a new predictive model that examines spore-forming bacteria and when they emerge, according to research published in the Journal of Dairy Science. All along the milk production path--from farm to processing plant to consumers’ refrigerators--some spore-forming bacteria can survive even the best pasteurization regimens or the cleanest dairy production plants. The bacteria can subsequently germinate and spoil milk. Ariel Buehler, Ph.D., the paper’s lead author, says members of the spore-forming bacillus, Paenibacillus and Viridibacillus genera are ubiquitous throughout nature. They have been found throughout the dairy chain, including in farming soil, silage, feed, cow bedding material, milking equipment and in raw and pasteurized milk. Additionally, the bacteria can survive harsh heat, desiccation (dryness) and sanitizers. When they have the opportunity to grow in pasteurized milk, they can cause off-flavors and curdling. “This is a considerable problem. If we can reduce the spoilage from spore-forming bacteria--by reducing their presence and by controlling their outgrowth--we can see the shelf life for milk improve from two weeks to perhaps a month,” says Nicole Martin, research support specialist at Cornell’s New York State Milk Quality Improvement Program laboratory. Spores can be reduced in microfiltered milk products, which is currently an emerging trend in the dairy industry, and the research finds that temperature is a key. The team created a new predictive model that showed refrigerated milk at 39.2 degrees Fahrenheit dramatically lowers the mean concentration of spore-forming bacteria. By decreasing the refrigeration temperature from 42.8 degrees to 39.2 degrees, only 9% of milk half gallons were spoiled after 21 days, compared with 66% of half gallons held at the higher temperature. 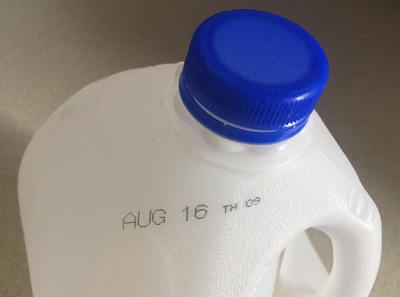 Wiedmann imagines a day--perhaps in five to eight years--when consumers find no dates stamped on milk containers. Instead, a scannable barcode could provide the milk’s production history and an accurate use-by date. Cartons could also sport a time-temperature indicator that communicates shelf-life prediction.